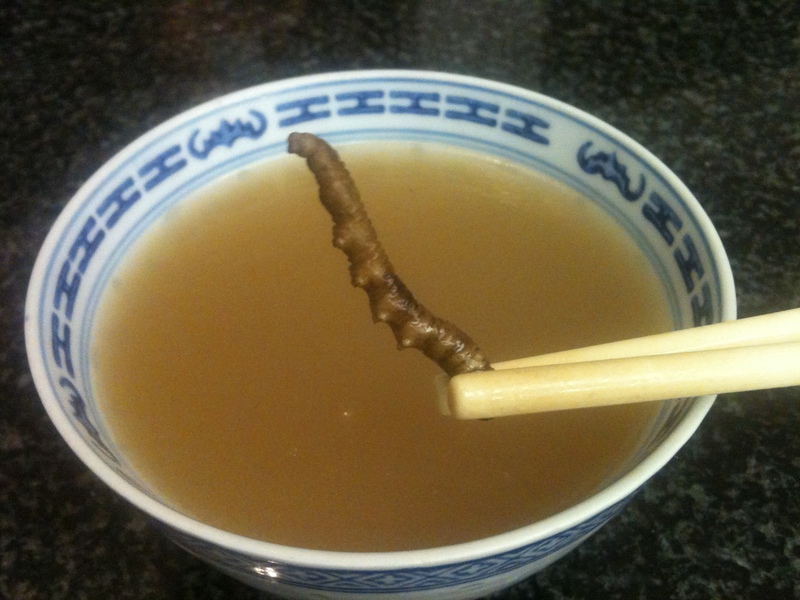 According to Chinese medicine, “dong chong cho” or ‘winter worm summer grass’ or caterpillar fungus (ophiocordyceps sinensis), has many health benefits. Despite its high price tag, many Chinese families will boil it in a soup to improve their health. After being boiled, the “dong chong cho” does not really taste like anything, and it has a nice slight crunch in texture. This is how my mom makes “dong chong cho” soup. Soak the dong chong cho in cool water for 2 hours. Then rinse and scrub off all dirt from the dong chong cho. Place the chicken or duck, pork, dong chong cho, yam sticks, goji berries, and dried mandarin peel into a large stock pot and fill it with enough water to cover all the ingredients. Bring the soup to a rolling boil over high heat, and then reduce the heat to maintain a strong simmer, covered, for 2 1/2 hours. Stir occasionally and add salt to taste. Serve immediately. Discard the mandarin peel. The pork meat can be served separately with soy sauce and/or hot sauce as dippers. The meat from the chicken or duck will likely be too dry to enjoy, but be sure to eat the dong cho cho, yam sticks, and goji berries. Leftovers should be kept in the refrigerator. This soup tastes better the next day. You can add more water and bring the ingredients back up to a boil to make more soup, but note that it will be less flavourful.